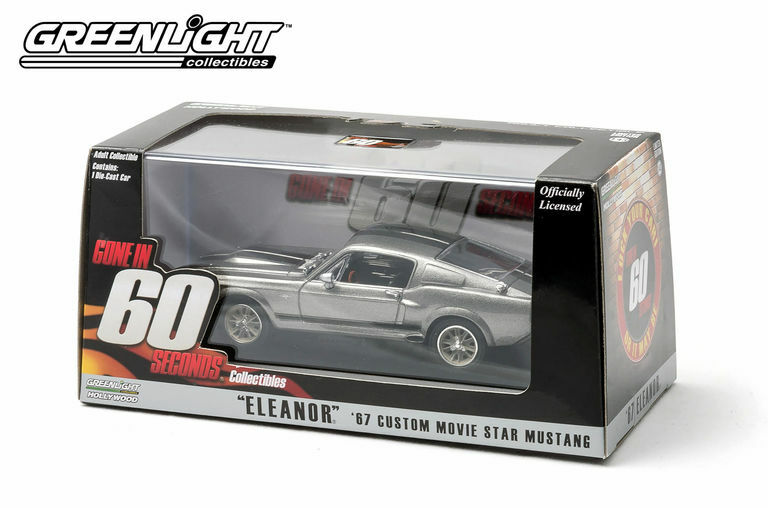 This GreenLight "Eleanor" 1967 Ford Mustang is a 100% authentic 1:43 true-to-scale die-cast replica featuring die-cast metal body, metal chassis, detailed wheels, chrome accents and accurate factory paint job. Comes in an acrylic case with authentic movie themed packaging. Gone In 60 Seconds is an American action/heist film known for having wrecked and destroyed 93 cars in a car chase scene. GreenLight takes iconic film and television vehicles from past and present and brings them to life with four-wheeled die-cast replicas. Officially licensed by respective movie and automobile companies. Protective acrylic case includes a plastic base, perfect for displaying out in the open. Authentic paint schemes from the Gone In Sixty Seconds movie franchise.